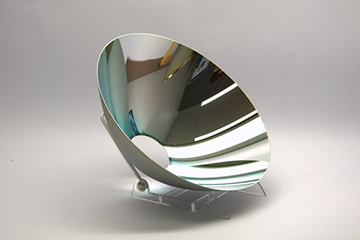 H-series DCC | Optiforms, Inc.
Optiforms H-Series DCC High Temperature thin film optical coatings are proven to out-perform industry standard coatings in thermal testing results. This coating is a durable hybrid coating developed for illumination applications such as motion picture projection systems. 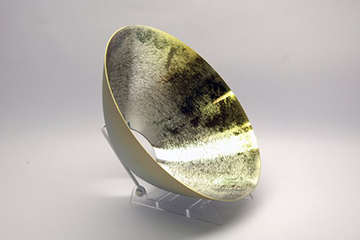 A high reflectance dichroic coating for the visible spectrum (over 95% average reflectance) is combined with an infrared absorbing component, allowing over 75% of the infrared (heat) energy to be absorbed by the reflector. Optiforms H-Series optical coatings are proven to out-perform industry standard coatings in thermal testing results. At 450° C the new coating performs well. The Industry standard coating suffered a catastrophic failure at these high temperatures. Long term temperature and environmental test results can be found here.